Just ordered up some boots for Clyde the dog. We got these from Ruff Wear. You are probably thinking that I am nuts, why would you pay $60 on a pair of shoes for a dog? 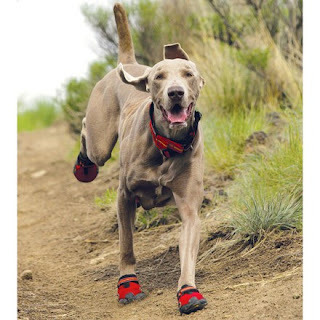 Clyde has some pretty tough feet, but I want to take him out hiking a few times next year. One of my nightmares is being a few miles out and having him lay down because his feet are beat up. There is no way I could carry the guy for very far. These will help a great deal with that fear. The snow is a no-brainer. I make a couple of bare handed snow-balls and I am done. He goes for a half hour walk on it... He doesn't complain, but I am pretty sure it isn't great for him. I'm just giving him an extra edge. Pretty amazing when you think about it, dogs walking around in all conditions barefoot. Us humans with the advent of shoes have pussified our feet. We'll be sure to shoot video when we put them on for the first time... I hear it can be pretty hilarious! BTW, it is snowing again. We may just be able to have a white Christmas this year. I'm keeping my fingers crossed!